Generic Sample Pack photo. 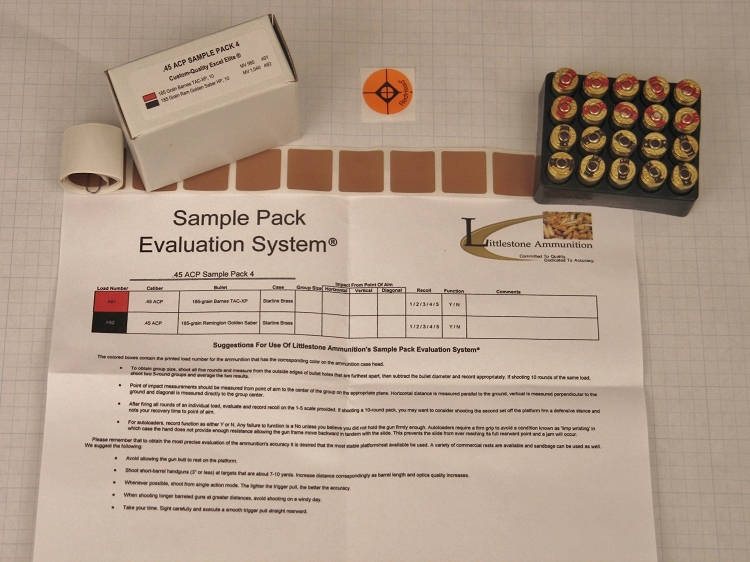 Click On Photos Below For Identification Of Other Bullets Loaded In This Sample Pack's Ammunition. Ten rounds loaded with 300-grain Cast Performance Long Flat Nose Gas Checked bullets. Cast Performance bullets are lead bullets molded from Lead Bullet Technology (LBT) style molds. They are cast from virgin alloy and hardened to a Brinell Hardness of 18-21. They penetrate deeply and do not fragment on bone. LBT style heat-treated solids are rapidly becoming the standard by which all others compare handgun-hunting bullets. This design of bullet does not depend on expansion as do soft point and hollow point bullets, but in fact the performance level achieved by the LBT design is far superior to conventional bullets. The degree of penetration reported by some of our customers with these bullets is truly remarkable, including full-length passage from end to end on some larger hogs. They don?t lead the bore and have been driven as fast as 3,100 fps without causing leading. This Long Flat Nose version has an average frontal surface to produce a good combination of penetration and shock at impact. Starline brass cases. Ten rounds loaded with 335-grain Cast Performance Wide Long Nose Gas Checked bullets. Though this also is a flat point gas checked bullet, the front is not quite as wide as the wide flat nose version and these bullets tend to run slightly longer than the wide flat nose of equal weight and caliber. This bullet is also slightly more aerodynamic than its wide nose cousin, and if driven at equal velocity the long nose version will penetrate somewhat farther than the wide nose version of the bullet if weight and caliber are the same. Starline brass cases.